h.e.l.p. is a Health Equipment Lending Program, designed to provide access to durable home medical equipment for Ozaukee County seniors in need. h.e.l.p. 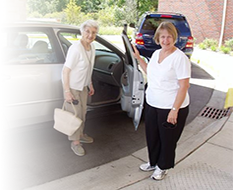 accepts donations of durable home medical equipment, within our guidelines, that is in good working condition. h.e.l.p. evaluates, cleans and readies the equipment to loan. h.e.l.p. loans the items to those in need. A deposit of $10 to $20 per item is refunded upon return of cleaned, functioning equipment. h.e.l.p. can benefit people in need on a short-term basis during recovery from an illness, surgery or injury or on a longer term basis for an individual living with a disability. h.e.l.p. is a collaboration of community partners in Ozaukee County who believe those in need of durable home medical equipment should have access to it. Recycling and reuse of durable home medical equipment makes sense. When h.e.l.p. lends gently used equipment, our community benefits. It ensures that necessary medical equipment is available to those who need it most. Please call us if you are unsure about any item! Please call for information on equipment that is available. Inventory is limited and dependent upon donations and space. We will check our inventory and if the item is available, set up a time for you to pick up. Please call for information on delivery. Delivery may be available on a limited basis. Each piece of loaned equipment requires a $10 deposit ($20 for wheelchairs). We will hold your deposit and renew items every 3 months for as long as it is needed. Please return equipment when it no longer is needed. Deposit will be refunded when equipment is returned clean and in good working order. We will make every effort to accept and loan your item(s), but not all equipment may meet our requirements. Pick up may be an option. Please call for information on donating items at (262) 618-2191. We will determine if we are able to take your item and set up a drop-off time. Please call for information on pick-up of item(s) you are interested in donating. Requests will be handled on a case-by-case basis. There are many ways to h.e.l.p. and any time you are able to give is appreciated! h.e.l.p. a little, h.e.l.p. a lot! CONTACT the Ozaukee h.e.l.p Corner at 262-618-2191 if you would like to be involved.